Ambivalence. Dread. Fascination. Resignation. 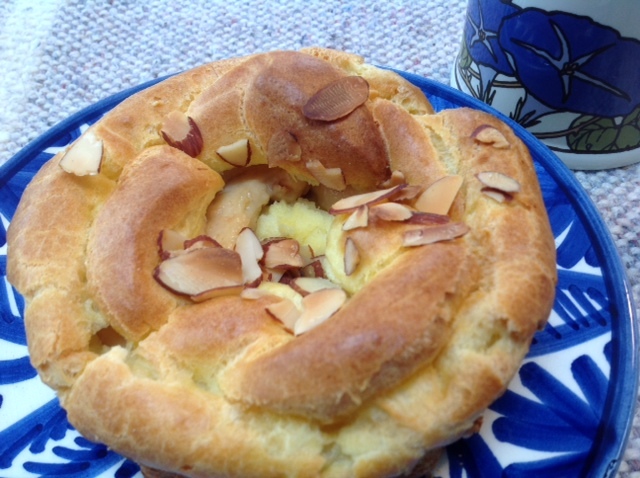 I’ll admit to a full range of emotions about this week’s selection for French Fridays with Dorie: Paris-Brest. What is a Paris-Brest, you ask? 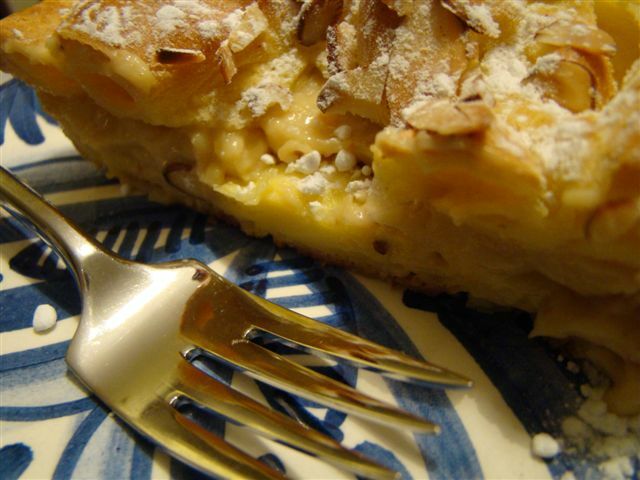 It’s a special pastry that was created in honor of a bicycle race. How French! Every four years, the bicycle race is held between Paris and, you guessed it, Brest, a city in Brittany, in northwestern France. OK, that’s the etymology, but what is it? Reminiscent of a bicycle wheel, it’s a ring of choux pastry (the same dough as cream puffs) filled with an almondy pastry cream. So why the emotional range? Well, even though I’ve made it before, and it’s challenging, but doable, pate a choux is not my favorite dough. Pastry cream? A little intimidating to make, though I think we’ve made it before for FFwD (éclairs?) Not my favorite, loads of calories, and Howard showed no interest in sharing. One concession was to “minify” (nod to Mardi). At her suggestion, I planned to make one small ring for me, form the remaining dough into cream puffs to freeze and save for later. I was further inspired when I saw Christy’s mini rings on Instagram, piped into and baked in mini-tart pans. I had a plan. 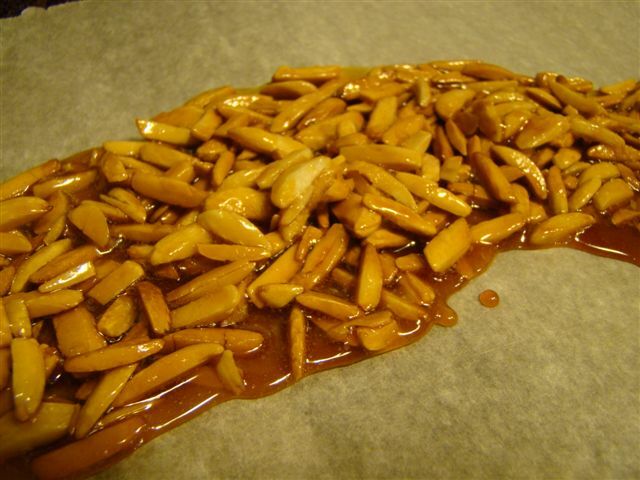 First, I set out to make the caramelized almonds that flavor the pastry cream. I didn’t have any whole blanched almonds, only slivered, which have a whole lot more surface area than whole ones. I decided to double the caramel to be sure to have enough coating. It worked out perfectly. Wow! Those caramelized almonds were delicious. We, Howard and I, could have nibbled on the whole batch. 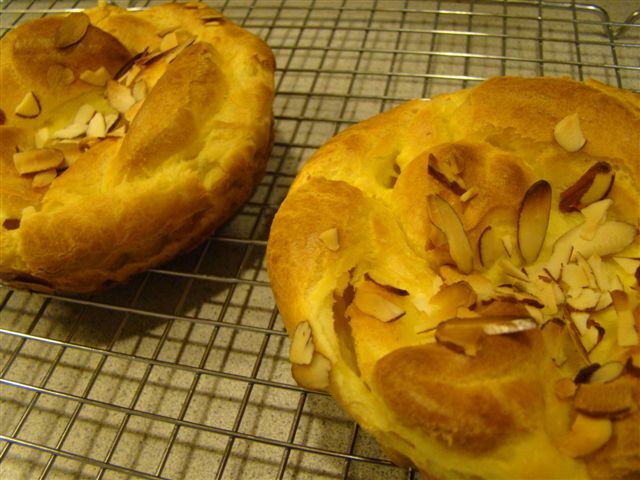 The almonds even sparked his interest enough that I varied my plan and made two rings so Howard could try Paris-Brest too. Almond Praline: Next Year’s Holiday Food Gifts? I didn’t have the right kind of pastry tip, so for piping my rings, I made do with a ziplock bag and scissors to cut off its corner. It worked great. The mini pastry rings were so cute. The center of bottom filled in, but when I sliced it in half to fill, the top still had its hole. 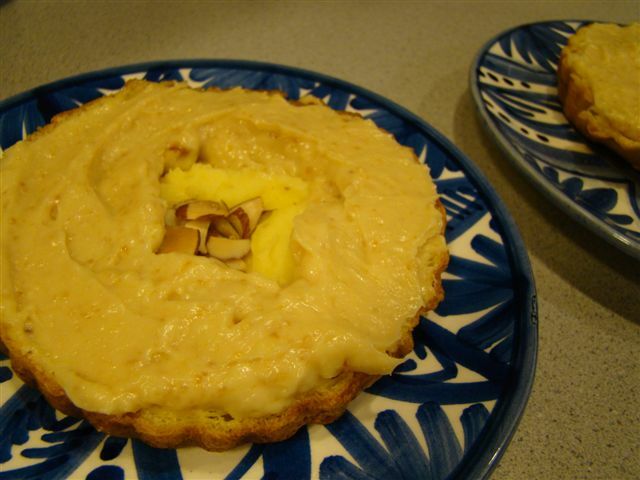 I removed most of the dough in the bottom half of the pastry ring, filled it with the pulverized caramelized almonds mixed into pastry cream, and put the other half on top. Then, we waited an hour for the Paris-Brest to chill. A sprinkle of confectioners’ sugar to dress it up before serving, and we had dessert. I will say that this is a gorgeous dessert. Certainly, it looked like it came from the closest patisserie, not my kitchen. As for how it tasted? It was as good as it looked, if you like this kind of thing. No matter how I try to spin it, custard just isn’t at the top of my list. However, it was a worthwhile experiment, and I impressed myself with a professional looking treat. 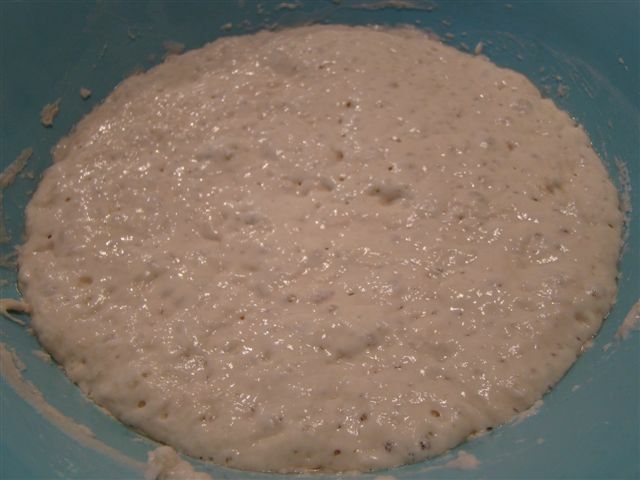 The recipe has just four of the most basic ingredients: flour, yeast, salt and water. Why I haven’t I tried it before now? I think it was when I read that the plastic knob on many Dutch oven lids don’t withstand the high temperature called for that I was deterred. My Le Creuset is one of my most prized possessions (not to be materialistic) and I didn’t want to ruin it for bread. Enter the Bread Dome. An amazing woman I know is the CEO and founder of a company called The Grommet. It is a curated shopping website that launches undiscovered products created by passionate makers with inspiring back stories. You should definitely sign up for their daily emails. One day back in fall, the featured Grommet was the Bread Dome. 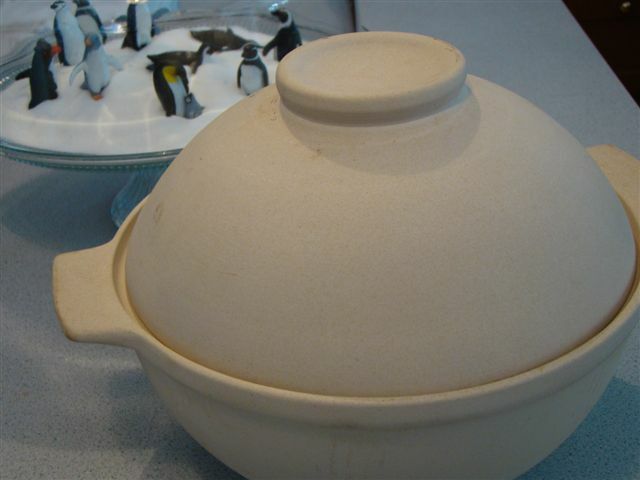 This seemed like the perfect alternative to my Le Creuset, and a good holiday gift idea. The Bread Dome is made of similar material to my pizza stone (it’s actually made by the same company). The inside of the bottom bowl is glazed, but everything else is unglazed. Just like a Dutch oven, the dome acts as a vessel to capture the steam released by the wet dough as it bakes at a very high heat. So, I finally gave it try. I don’t know why I waited so long. It is SO EASY. First, I combined flour, yeast, and salt with water, which took ust a few minutes, including taking out the bowl and ingredients, measuring, and stirring. Because my house is so cold this time of year, I used warm water, about 100F. The original recipe doesn’t specify, so I think water straight from the tap is fine. 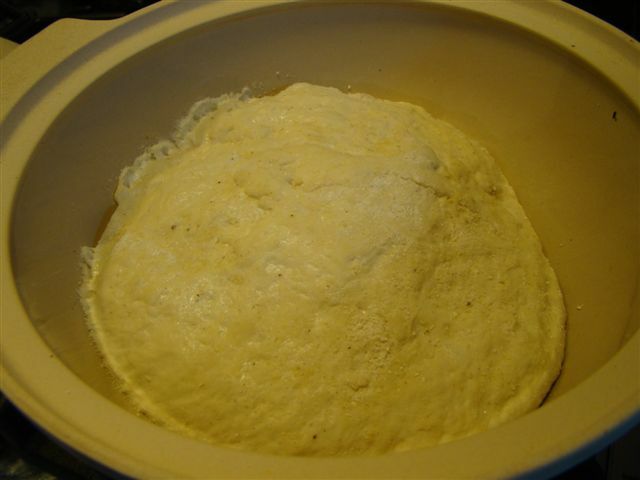 This wet dough sat on the counter for 12 to 18 hours to rise. It’s ready when there are lots of little bubbles on top. Next, I turned the bread onto a floured surface and folded it over itself a couple times like folding a letter in thirds to put into an envelope. I did this twice, one set of folds in each direction. The bread rests again for about 15 minutes. 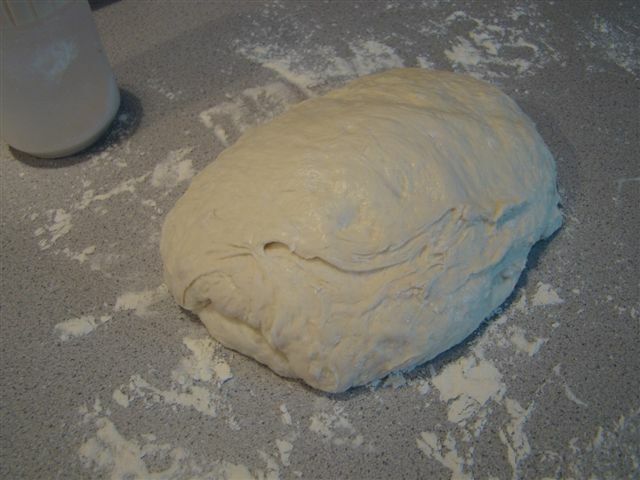 The dough needs one more rise before it is ready to bake. I covered a large baking sheet with a tea towel dusted generously with flour or cornmeal (I prefer how the cornmeal worked). 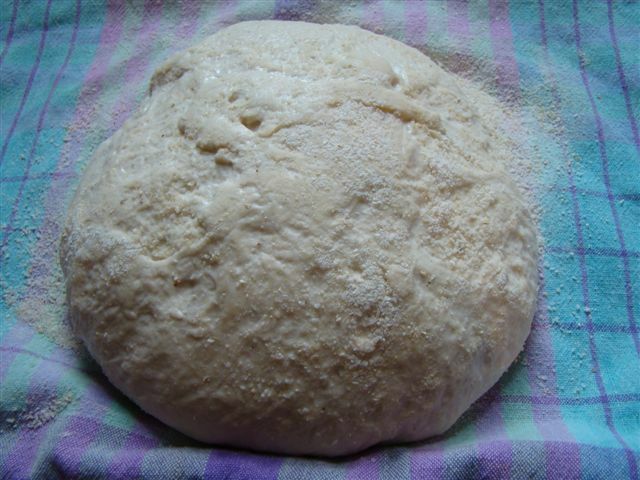 Then, with well floured hands, because the dough is very sticky, I shaped the dough into a ball and placed it seam side down on the towel. Finally, I dusted the round with more flour or cornmeal and covered it with another tea towel before letting it rest for another 2 hours. About half an hour before the dough was done rising, I placed the bread dome into the oven and set it to preheat to 450F. When the dough was ready, I carefully took the bread dome out of the oven, opened it up and gently transferred the dough to the dome, seam side up. The lid goes back on and the dome goes back in the oven to bake for 30 minutes. The last step is to remove the lid and let it back another 15 minutes or so, until the loaf is golden brown. I let the loaf cool on a wire rack until it’s time to cut it open. The crust is perfect, crispy and not soft at all. The crumb is moist and airy, like my favorite artisan loaves. I’m in love with this loaf. I’ve already made it twice. The outer edge does get stale quickly, but when it’s cut off, the inside is still moist and fresh. I think this bread will make amazing croutons. 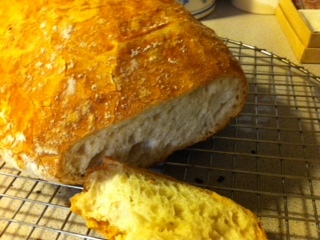 Next time, I’ll play around with some variations, maybe adding some olives for an olive loaf. If you have a few minutes, give this bread a try. You don’t really need the Bread Dome (though it is fun to get new toys). You could use your Dutch oven, just be careful with the knob if it’s plastic. I hope you are enamored like I am. Let me know what you think. And don’t forget to sign up for The Grommet emails. You never know what you’ll discover.